BERKELEY — The sponge, which was not recognized as an animal until the 19th century, is now the simplest and most ancient group of animals to have their genome sequenced. 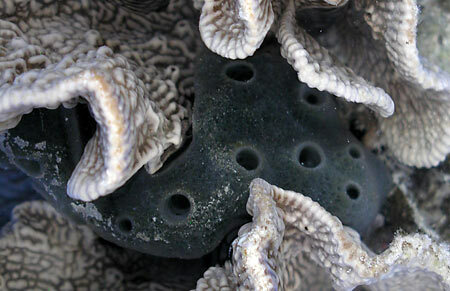 In a paper appearing in the August 5 issue of the journal Nature, a team of researchers led by Daniel Rokhsar of the University of California, Berkeley, and the Department of Energy’s Joint Genome Institute (JGI), report the draft genome sequence of the sea sponge Amphimedon queenslandica and several insights the genome gives into the origins of both the first animals and cancer. Sponges are often described as the “simplest” living animals, while humans are considered relatively “complex,” but how this differential complexity is encoded in the genome is still a major question in biology The new study shows that, while the sponge genome contains most of the gene families found in humans, the number of genes in each family has changed significantly over the past 600 million years. By analyzing which gene families were enriched or depleted in different groups of animals, the authors identified groups of gene functions that are associated with morphological complexity. “The genome raises questions of what it means to be an animal,” said first author Mansi Srivastava, a former UC Berkeley graduate student who now is a post-doctoral associate at the Whitehead Institute for Biomedical Research in Cambridge, Mass. Some of the missing components are involved in the cell cycle, the series of steps cells go through in order to divide. Among these is the enzyme family known as cyclin-dependent kinase 4/6 (CDK 4/6), which in mammals is crucial to transitioning between phases of the cell cycle. Though CDK4/6 was not found in the sponge genome, it is present in the sea anemone genome, raising the question of whether the appearance of CDK4/6 in the ancestor of “true” animals (eumetazoans) changed the animal cell cycle in a fundamental way. Inhibitors of CDK 4/6 halt the cell cycle and are used to treat breast cancer. “What marked the evolutionary origin of animals was the ability of individual cells to assume specialized properties and work together for the greater good of the entire organism. The sponge represents a window on this ancient and momentous event,” said coauthor Dr. Kenneth S. Kosik, the Harriman Professor of Neuroscience at UC Santa Barbara and co-director of the Neuroscience Research Institute. “The beauty of having this genome is that now we can ask about all known biological processes, and go through hundreds of genes to tell definitively whether or not our common animal ancestor had them or not,” Srivastava said.